Keep your Finger on the Pulse of 2016! Did you hear? 2016 has been declared the International Year of Pulses, and we here at Shiloh Farms couldn’t be more excited! So you might be wondering, what exactly are pulses? Well, believe it or not, you are probably already a fan and have likely been keeping your pantry stocked with them for years! Pulses are a class of legumes primarily grown for their dried seed. They count among their ranks such favorites as lentils, dried peas, and many varieties of dried beans. Rich in nutrients (including fiber, protein, complex carbohydrates, and a wide variety of vitamins and minerals), pulses have a multitude of culinary uses. A staple this time of year in soups and stews, pulses are also a welcome addition to salads, spreads, casseroles, veggie burgers, and so much more. Mashed or ground into a flour, they can even be added to breads, crackers, and other baked goods (even brownies!). Pulses are also very important from an agricultural standpoint. They are vital to effective crop rotation, as they act as natural fertilizers by helping to fix nitrogen (an essential element for life) in the soil. Even better, pulses are a hearty and highly sustainable crop, typically requiring far less water to grow than other agricultural products. Adzuki Beans: These small, red beans have a nutty, sweet flavor, making them a versatile addition to both sweet and savory dishes. A rich source of protein, fiber, and minerals, adzuki beans are particulary high in iron, magnesium, and folic acid. Black Eyed Peas: A staple in the Southern diet for over 300 years, black-eyed peas have long been associated with good luck. What is definitely lucky is their abundance of nutrients, including protein, fiber, iron, potassium, magnesium, and B Vitamins. Garbanzo Beans: High in protein, fiber, and a variety of vitamins and minerals (including potassium, magnesium, zinc, and folate), garbanzo beans (or chickpeas) have been a staple of Middle Eastern, Mediterranean, and African cuisines for centuries. Green Lentils: Generally no more than ¼” in diameter, green lentils pack a nutritional wallop despite their small size. High in dietary fiber, B Vitamins, and a variety of minerals, lentils are behind only soybeans among legumes in their protein content by mass! Looking for something a bit different? Why not try our PureLiving Sprouted Garbanzo or Lentil Flours? Already sprouted and milled for your convenience, they are a wonderfully unique way to incorporate pulses into your diet! Did you know that January is Soup Month? At Shiloh Farms, we’ve been celebrating on our Facebook page all week by sharing tips for achieving the perfect pot of soup and some great recipes that we can’t wait to try out ourselves. 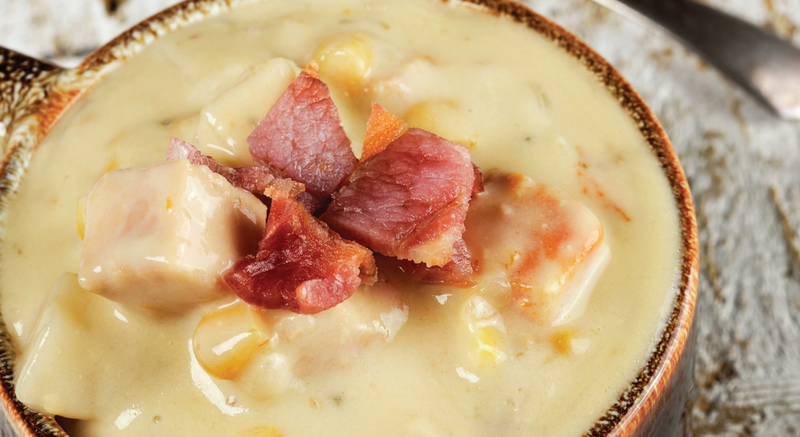 Today we are contributing a recipe of our own – a hearty Chicken Corn Chowder made with PureLiving Sprouted Brown Rice Flour. As simple to make as it is delicious, this filling soup is sure to become a favorite! Visit PureLiving for this and other great recipes. Be sure to check out our Facebook page all week long for more Soup Month goodness and keep an eye out for a Facebook-exclusive offer to save 40% on all Legumes at Shiloh Farms!